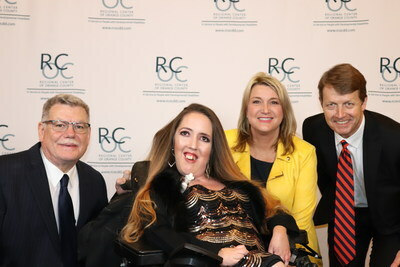 GARDEN GROVE, Calif., March 25, 2019 /PRNewswire/ -- Regional Center of Orange County (RCOC) honored nine Orange County individuals and organizations at its 22nd annual Spotlight Awards dinner-dance on Fri., March 22. Guest hosted by CBS2/KCAL9's Emmy Award-winning reporter Michele Gile, the event took place at the Embassy Suites Hotel in Garden Grove and was attended by nearly 600 people. RCOC created the Spotlight Awards in 1997 to honor those in Orange County who have advanced the quality of life for people with developmental disabilities, and enlists corporate sponsors to provide funding that keeps ticket prices accessible to the individuals and families served by the agency. Healthcare Professional: UCI Clinical Professor Marc Lerner, M.D. Regional Center of Orange County is the private, nonprofit organization contracted by the State of California to coordinate lifelong services and supports for more than 21,000 Orange County residents with developmental disabilities and their families. The Regional Center is the first stop for those seeking to obtain local services and supports to help them live safely and with dignity in the community. Developmental disabilities include intellectual disabilities, autism, epilepsy and cerebral palsy. Learn more at www.rcocdd.com.